Maine used to be a major sardine producer -- it was our largest fishery, by dollar value, and there were literally dozens of canneries all along the coast. All but one are gone now, but the Penobscot Marine Museum retains part of Maine's sardine heritage with its flagship, the 83' sardine carrier Jacob Pike. He thought we might be interested, and while I can't speak for the entire Society, I think he was right. 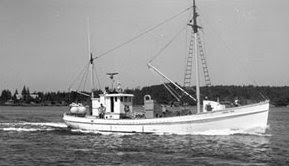 The Penobscot Marine Museum was given the best preserved and arguably the handsomest sardine carrier ever built—the 1949 83-footer JACOB PIKE. When her home cannery in Rockland closed in 1997, industry veteran Dana Rice of Birch Harbor bought the vessel to use as a bait carrier but with a dream of preserving her. Last summer that dream began to come true when Taylor Allen and Martha White bought the JACOB PIKE and in December donated her to the museum. The resulting publicity has brought forth stories worth preserving, from people like Dan Holmes who crewed aboard for sixteen years, John Melquist who managed the cannery the vessel last worked from, and Raymond Wallace whose father Roy designed the vessel and served as her master builder. There will be other stories— many others—that this historic sardine carrier will inspire. Short-term plans for the PIKE call for her to roam the midcoast during the coming summers much as she did during her working days, but with an educational mission: raising awareness of the now-defunct herring industry and the efficient carriers that helped make it possible. Later, the aim is for her to become the centerpiece for a permanent, land-based sardine exhibit as well as for an exhibit of smaller craft to showcase the heritage of Maine’s boat- and shipbuilding skills, past and present. There's a nice multimedia slide show on The Pike Page. Go to this Article, scroll down to the bottom and Check Out image #2 titled Sardine Man!! There are no Rules, but there is Tradition. Know your history. Your blog makes me hungry - I like fish!